I like to get out of Bangkok and get some fresh air on weekends. Many times I visit places like Samed Island in Rayong, Lan isalnd in Pattaya, Hua Hin or Khao Yai. 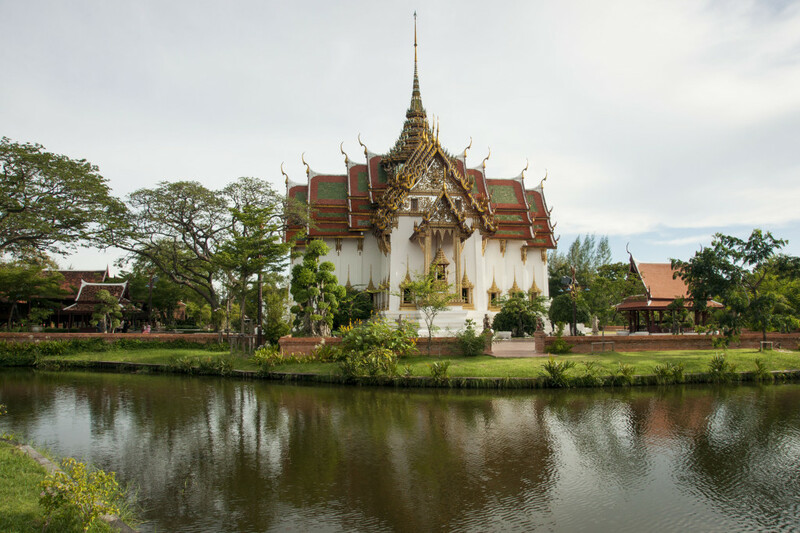 I also like to find something fun to do on a day trip like going to a museum, and I have to say that I feel a little embarrassed that I just learned that the Ancient City is just under an hour by car from the center of Bangkok where you can spend a nice day out. (Actually, I heard of this place long time ago and misunderstood that it was a few hours away from home so I didn’t think of making my way there). Ancient Siam aka Ancient City or also known as เมืองโบราณ (mueang boran) is a unique outdoor park museum features replica of the county’s significant historic architecture and monuments from various parts of Thailand in the magnificent park in the shape of the map of Thailand. 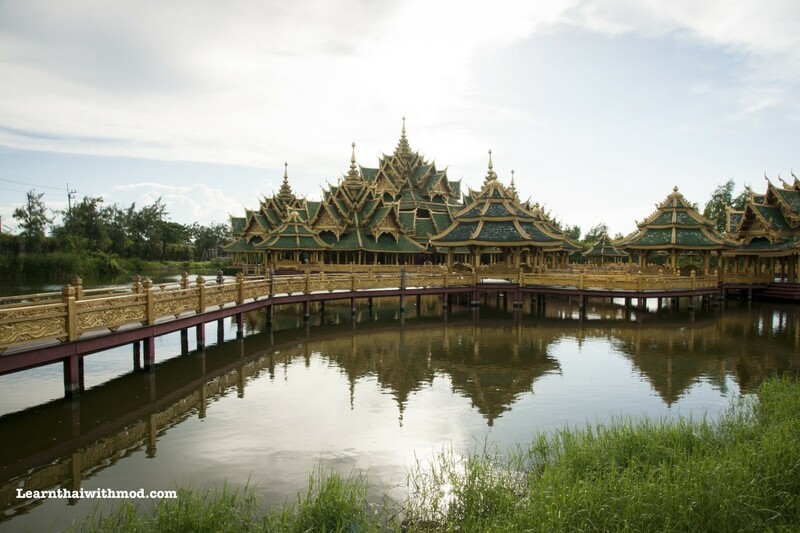 Ancient City is located close to the Crocodile Farm in Bangpoo, Samut Prakan province, about 33 km southeast of central Bangkok. The area in the Ancient City covers 600 rai (96 hectares or 240 acres, 1 rai = 1,600 sq.mtrs or 0.4 acres). 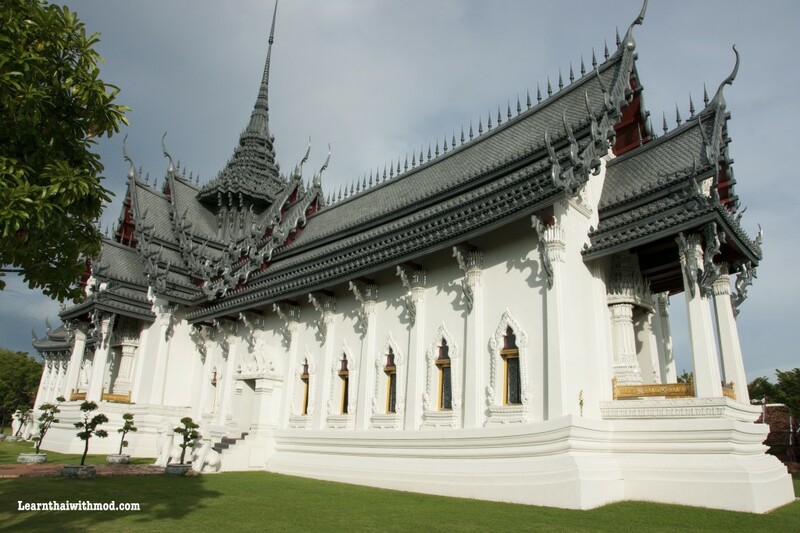 It was constructed in 1963 under the patronage of Lek Viriyaphant (1914 – 2000) the man who was also responsible for the Sanctuary of Truth in Pattaya and the Erawan Museum in Samut Prakan. He had a passion on preserving the country’s cultural heritage, history and art, which I found fascinating. The entrance to Muang Boran is modeled after the oldest stone fence at Maha That Temple, Chalieng, Sukhothai Province. The stone fence dates back to the 12th or 13th century A.D. 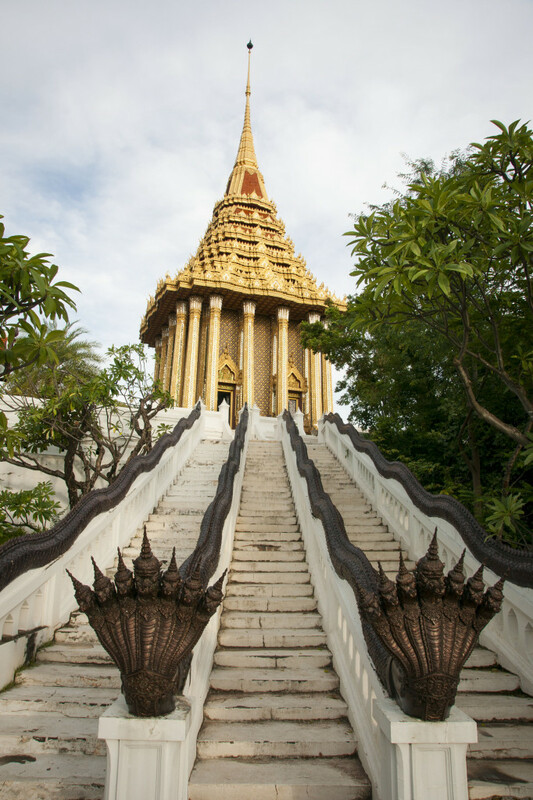 Through the City Wall and Gates I am led into the artistic and imaginative preserves of Thai heritage. The Pavilion of the Enlightened symbolizes the story of 500 monks from different cultural backgrounds who attained Nirvana. Visiting the Ancient City is like being in a little kingdom. 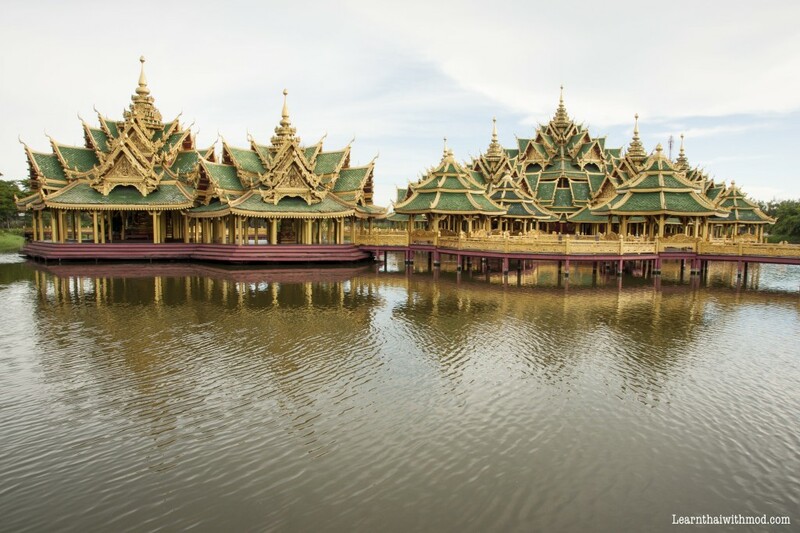 There are 116 structures including magnificent restored buildings, full size replicas & scaled down versions, temples, palaces, a floating market and many more. It also has mini markets with people making and selling handicrafts and Thai snacks. The periods of these ancient ruins and monuments cover the Dvaravati, Srivichai, Lopburi, Lanna, Lan Chang, Sukhothai, U-tong, Ayuthaya, Thonburi and Rattanakosin eras. Some of the structures are creative designs to symbolize religious beliefs and concepts. Sanphet Prasat Palace in Ayutthaya which was burnt to the ground in 1767 when the Burmese destroyed the city. Only the brick base of the palace remains today. This replica was reconstructed based on archeological and historical records. 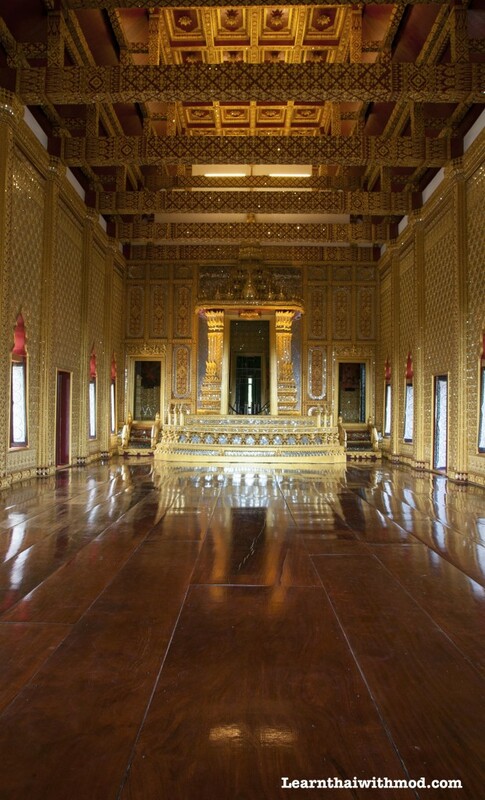 Inside the Sanphet Prasat Palace, very beautiful. Dusit Maha Prasat Palace in the Grand Palace, Bangkok was built in 1806 in the reign of King Rama I as an audience hall. Renovations in the reign of King Rama III completely changed the original design. The replica in Muang Boran is based on the original design obtained through research and old photos. 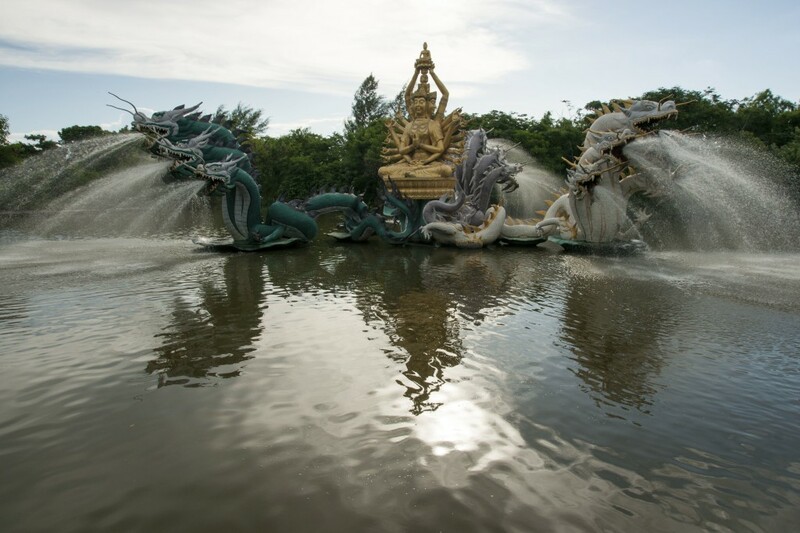 Muang Boran also consists of creative designs to represent religious concepts and beliefs. This one is Bodhisattva Avalokitesavara (Kuan Yin) depicts the benevolent Goddess of Mercy performing a miracle to fend off evil forces. I highly recommend this place for anyone who wants to get a break from Bangkok’s busy city life. You can enjoy decent Thai food at the various vendors and drive, bike or cart around past the impressive replica sites. Tip: It could be pretty hot if you go there during the day, you might want to wear light clothes and bring your shades or hat. 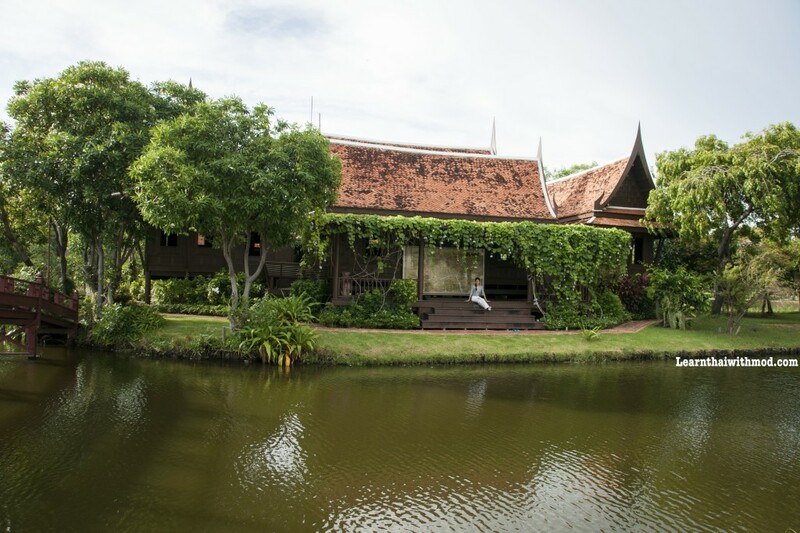 Khun Phaen House – The Ayutthaya style house at Muang Boran is modeled after the original Khun Phaen House located in a pond in the vicinity of the ancient prison located behind Wat Ket, Ayutthaya Province. I love it! 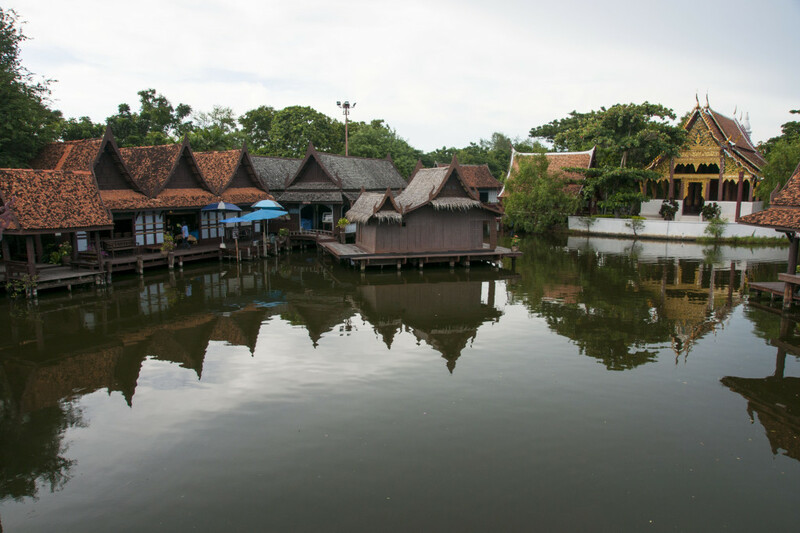 The cluster of buildings in this floating market was removed from the original site and rebuilt in Mueang Boran. There are several restaurants here and it’s a pleasant place to stop for a meal. “The Footprint of the Lord Buddha”. The mondop housing the Footprint of the Lord Buddha, is an architectural style of Ayutthaya art. It is estab lished on the top of a hill in Saraburi Province. Muang Boran rebuilt Mondop of Footprint in accordance with two distinctive accounts from Thai literature. The footprint housed in the mondop at Muang Boran was a gift from an Indian president. 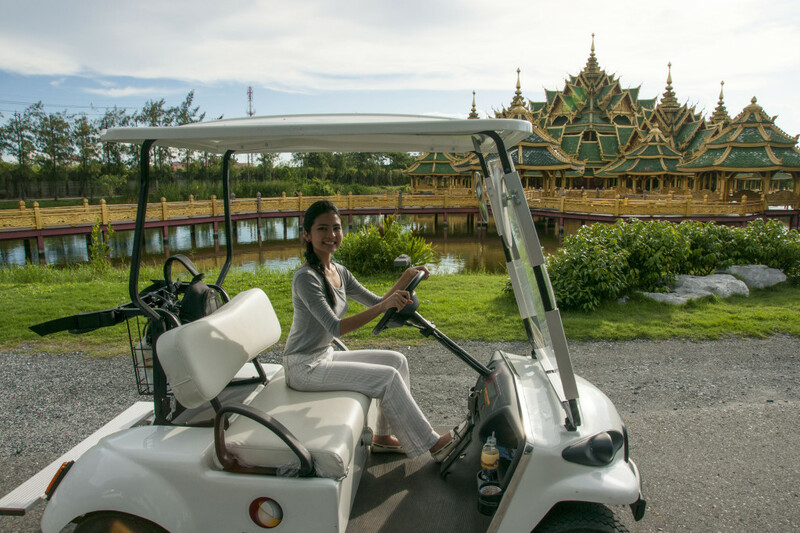 There are trams, bicycles (THB 50 baht per bike) and two-seater and four-seater electric golf carts (THB 150 per hour) available for hire to get around. You can drive in with your own car as well (THB 300 per entry). I opt for the golf cart because I have never driven one before, so I thought it would be a fun experience and it really was! getting around with this golf cart was fun! 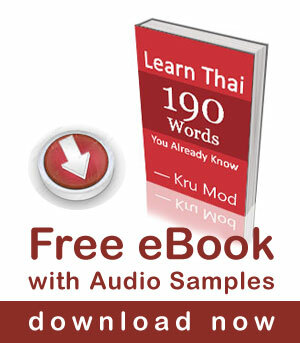 Well-informed and friendly guides are available in English and Thai. Take the Express Way as far as the Samrong-Samut Prakan Exit. Turn to the Samut Prakan Intersection. Turn left along the old Sukhumvit Road (towards Bangpoo) until you get to km. 33. The Ancient City is on the left. Taxi by meter is no more that 250 baht from the central Bangkok. Take air-conditioned bus No. 511 (Pinklao-Paknam) to the end of the line. From here, take the mini-bus No. 36. It passes the entrance to the Ancient City. How much the entrance fee for foreign worker with work permit? Some places allow a foreigner with a work permit to pay the same rate as a Thai. Some places don’t make an exception. I am sorry I don’t know how it works in the Ancient City. You should bring along your work permit when you go there. How long does it take to tour the whole area by car? It might take about one hour. Hi Poppy, I am sorry for the delay in my response. I hope you and your sister had a great time in Mueang Boran. When I was there they didn’t require driver license for renting a buggy car. I think in Thailand it is not needed. This ‘Thai’s pay taxes’ excuse is nonsense. If you go anywhere in Europe or the Americas as a Thai, are you charged up to ten times the price for entry? No you aren’t, but you don’t pay taxes there either, so what’s the difference? Is there any dress code to enter in palaces or wat or anywhere in the ancient city? I happened to come across your website while searching on Thai nicknames today, and I wanted to thank you for sharing all the cultural, and recreational articles of Thailand as well as your Thai teaching videos. I am certain that I could learn a lot from you, but I would like to think about it first. As for this article regarding the Ancient City, I’ve never visited it before, and it seems surprisingly close to Bangkok on Google Maps. Also, it really looks worth a 350-500 baht entry fee. Thank you for visiting my website, I am happy to hear that you like it. Thank you for your teaching … I korean and learning Thai language ..just one month.. In Korea many people watching your video ( youtube ) .. one more time .. thanks for your appreciate teaching..
Shame the YouTube got taken down. I enjoy your lessons, thank you. A question please. What do you think about charging different prices for Thai and foreigners? Although I am Thai, I personally don’t like dual pricing. Some places like national parks which are actually funded by the local tax contributions. As a non local, a usage fee would be reasonable. Some other private places, might not.